Donizetti’s Don Pasquale was first performed in 1843 and it is generally regarded as the high point of the opera buffa tradition. In keeping with that tradition, the work is inhabited by the characters of the commedia dell’arte – Pasquale is Pantalone, Ernesto the love-struck Pierrot, Norina is Columbine and so on. However, beneath the layers of froth and slapstick, there are elements of nastiness and cruelty within this work. The plot essentially involves an infirm, love-struck old man who is duped out of his money by two broke and amoral schemers. Overseeing these events is the manipulative Dr Malatesta who persuades, coerces and cajoles the main characters to act in particular ways in order to achieve the outcomes he wants. One might argue that Don Pasquale needs to be taught a lesson as he is trying to block his nephew Ernesto from marrying the woman he loves. However, this is not a strong enough reason to justify the disrespectful mocking of the elderly Pasquale and the money grabbing of the young couple. Mariame Clément’s production of Don Pasquale first appeared in 2011 and this revival features a new cast including Glyndebourne debuts by the Italian baritone Renato Girolami, Cuban-American Soprano Lisette Oropesa and Moldovan baritone Andrey Zhilikhovsky. Clément uses period costumes and a revolving stage and room furnishings and props are kept to a minimum. When the opera opens we see each of the main characters sleeping while Zhilikhovsky’s Dr Malesta prowls around the stage. Clément argues in the programme notes that her aim is to underline complex relationships and to show actual characters – and not just stereotyped puppets – within the very simple dramatic frame. She wants to eschew the cheap laughs and slapstick and to present the characters in a more natural environment. Given Donizetti’s very rounded drawing of the characters I can certainly see the argument for doing this. However, if we lose too much of the slapstick it can perhaps give undue emphasis to some of the more unpleasant motivations of the characters which leaves a nasty taste in the mouth. 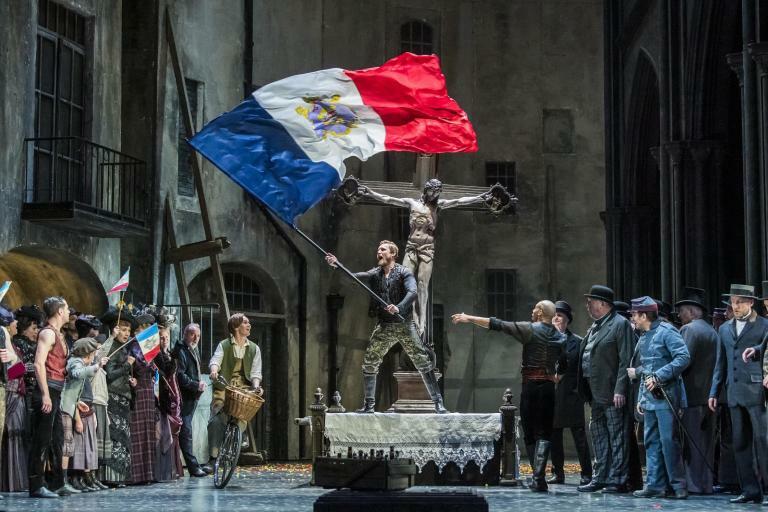 While there was some very fine comic acting in Act II, I would have liked to see a little more of the camp froth that can make this opera such a winning confection. The stand out performance of the evening was Lisette Oropesa in the role of Norina. Her Norina was a cool customer, ready to use her looks in order to secure financial stability and social respectability and with a contemptuous attitude towards the elderly Pasquale. Her handling of Donizetti’s vocal fireworks and coloratura was absolutely outstanding. The decorative vocal lines flowed with a mellifluous ease and she brought wonderful tone colouring to the vocal line and thrilling top notes. I also enjoyed Andrey Zhilikhovsky’s portrayal of the cunning Malatesta. There was an air of cold calculation about his Malatesta but he also showed an alertness and ability to think on his feet and a silky seductiveness best demonstrated when he joined Oropesa in her bubble bath. The singing was robust and well executed and he handled the quick-fire patter of the Act III duet ‘Aspetta aspetta, cara sposina’ with virtuoso aplomb. There was much to admire also in Renato Girolami’s portrayal of Don Pasquale. This was a sympathetic and rounded portrait and I enjoyed some of the comic verve he brought to Act II. Occasionally, I would have liked him to project a little more and to have given us a more varied tonal palette. Having said that much of the singing was admirable and he also handled the rapid patter extremely well in the Act III duet. Andrew Stenson brought a lyrical bloom to Ernesto’s vocal lines and I particularly enjoyed his Act III duet with Oropesa where the voices blended beautifully. Again, I would have liked him to project a little more and there were a few minor intonation problems. Giacomo Sagripanti did a terrific job keeping the cast, chorus and orchestra on track for the evening. He brought a jauntiness to Donizetti’s winsome melodies in the Overture and the pacing of the material was exemplary throughout. He was attentive to balance and he ensured the orchestral accompaniment remained flexible. The Glyndebourne Chorus distinguished themselves once again in Act III where they commented on the ongoing capers with a wry amusement. 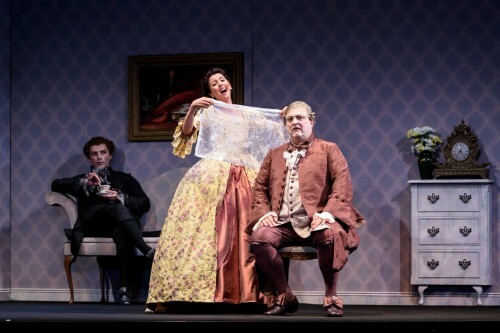 Overall, there was much to admire in this production of Don Pasquale although I would have liked to see a little more of the comic froth and high jinks. Oropesa was outstanding and clearly a soprano to watch out for in future. For more about opera at Glyndebourne click here.